I took this photo standing on top of the sail looking forward and down into the bridge cockpit. The "clamshells" can be seen port and starboard that make this cubbyhole disappear when rigged for dive. The plug extension cord for the bridge communication box is seen in the center. 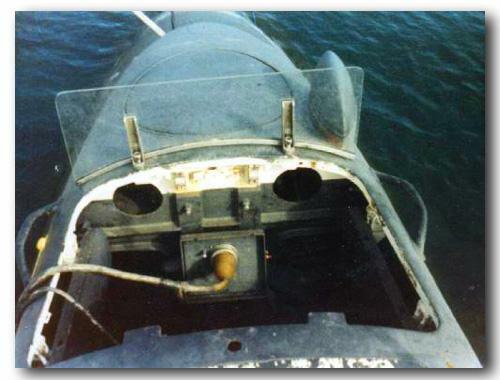 The Plexiglas windshield is used on the surface because at flank speed, a little over 20 knots or 25 mph, the wind is so loud you have to scream to be heard and it will rip the chart out of your hands. The circle in front of the windshield is the ESM electronic surveillance measures mast, and to the right is a sonar that listens for surface ships as the boat penetrates the thermal layer on the way to periscope depth. Up to three men man the bridge on the surface - the captain, officer of the deck and junior officer of the deck. Usually it is just the OOD and JOOD, but outside restricted waters, 50 miles from land but still far from the continental shelf, just the OOD will stand watch here, and the lookout has his own cubbyhole further aft. Steaming at night alone as the OOD was perhaps the best experience I ever had at sea, a cigar between my teeth, the stars shining above - stars at sea are ten times as bright and numerous as on land - and the bow wave below, the 15,000 shaft horsepower making the monster beneath your boots tremble with power. You can see where the paint has been blown off the sail by the depth charges. The boat looks salty from being under for ten weeks. She was as tired as we were.